"Super Smash Bros. Ultimate," the latest version of Nintendo's popular cartoon fighting game series, is one of the most hotly anticipated games of the year. After playing the final version, out Friday, I can also say it is one of the best Switch games yet. The latest in the long-running franchise, "Ultimate" brings together iconic characters from a wide variety of games including Nintendo's own Mario, Donkey Kong, Kirby, Zelda and Pikachu, as well as other well-known ones such as Sonic the Hedgehog, Pac-Man and Snake from "Metal Gear Solid." The game has two main gameplay experiences: "Smash," the popular head-to-head fighting mode where you can compete with friends or battle the computer, and "Spirits," a story-like game mode called "World of Light" where you need to battle to free characters from a mysterious "hand" deity that has captured them. The "World of Light" mode isn't as exciting as older versions of "Smash," particularly the Wii's "Super Smash Bros. Brawl" and its Subspace Emissary story. Playing through you battle the various main characters, as well as a large number of side ones, called "spirits," that can act as "perks" after you've defeated them to assist you in future battles in the mode. 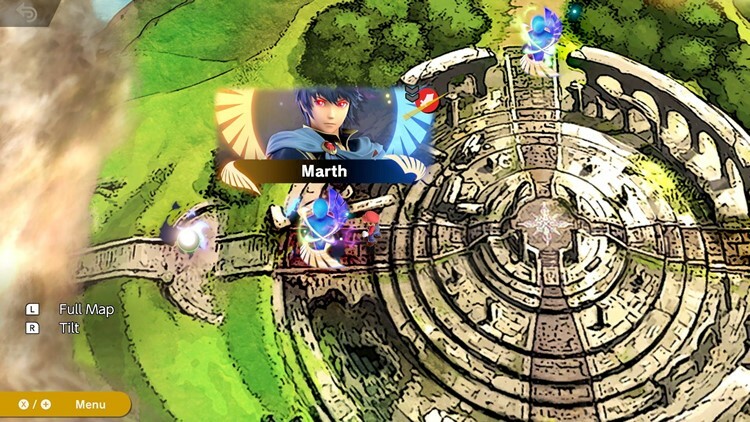 The map in "World of Light" in the "Super Smash Bros. Ultimate" video game. There is an additional "Spirit board" mode, which lets you unlock different "spirits" to boost your main characters in future fights in the "World of Light" game. After several hours of playing time, I found the "World of Light" mode to be enjoyable but greatly lacking a clear, overarching narrative to hook players in. Some battles will unlock the main fighter, others will unlock the "spirit." After unlocking the main character you'll be able to fight as the main character in this mode, equipping your fighter with the newly-won perks. 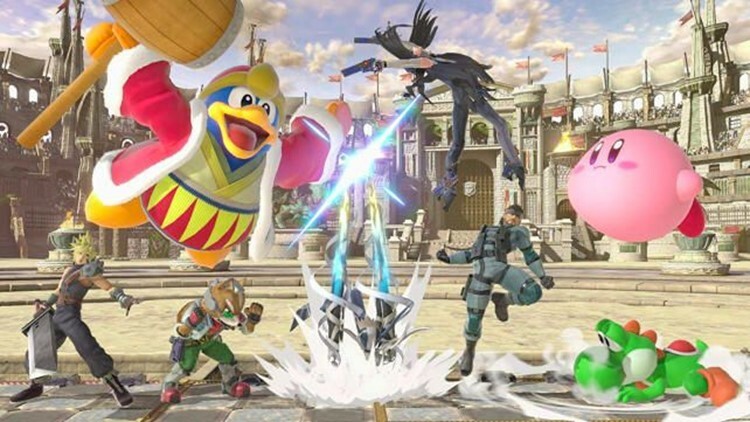 Characters unlocked here can then be used in the "Smash" mode, though fighters unlocked in the "Smash" mode do not carry over to "World of Light." To play with them in both locations you may need to unlock them twice. The option is enjoyable for a single-player mode, and its large map should provide hours of entertainment and a good way to fine tune your skills. But as has always been the case with "Super Smash Bros.," the real fun is when you play against other players. This is where the "Smash" mode comes in. 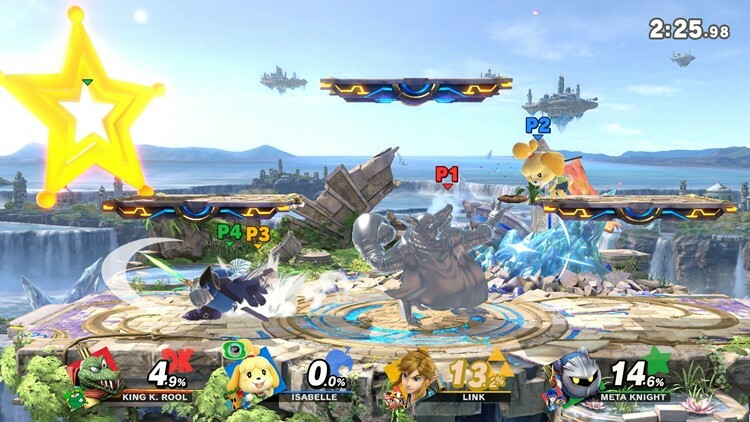 A "Smash" mode battle in "Super Smash Bros. Ultimate." With the ability to play head to head with as many as seven other players off of one Switch (assuming you have enough controllers), "Smash" is a perfect reminder that not all multiplayer games need to be online to be fun. Nor must they be massive "battle royales" like "Fortnite," "PUBG," "Call of Duty Black Ops 4" or "Red Dead Redemption 2." It is worth pointing out that there is an online mode that allows you to play matches over the internet through Nintendo's Switch Online service, but these are four-player battles. There is no "battle royale" mode here. However, I was unable to test this as Nintendo did not make the online functionality available to reviewers in advance of the game's release. "Smash" mode pits you against other players locally or against the computer. You start the game with the option to fight with any of the original eight "Smash Bros." characters: Mario, Link, Donkey Kong, Pikachu, Samus, Yoshi, Kirby and Fox. The more you play, the more new "challengers" appear. Battling and beating them will allow you to unlock the other 66 characters for use in future fights. The cartoon graphics and the arenas, known as "stages," look great on both the Switch's built-in display and on a TV when the Switch is docked. Nintendo has brought more than 100 stages into "Ultimate," some new ones as well as a number of classic ones from prior "Smash Bros." games. Each stage has its own quirks, and a new "stage morph" feature lets you bring a second stage into a single battle, allowing fights to be fresh even after hours of gameplay. The best part about this mode, however, is how easy it is to play with friends. Every Switch comes with two detachable Joy-Con controllers, which can be a single controller or removed from the main Switch console and shared with a friend to play together. Playing with the Joy-Cons is fine, though due to its limited buttons you don't have the same capabilities and controls you would get by playing with both Joy-Cons as a single controller or when using Nintendo's optional Pro Controller or GameCube controller. But it does let two players play together right out of the box, one of the best attributes of the Switch. As an increasing number of games go all in on the "battle royale" genre, Nintendo's latest "Smash" stays true to its roots, delivering not only one of the best Switch games yet but also one of the best video games of the year.